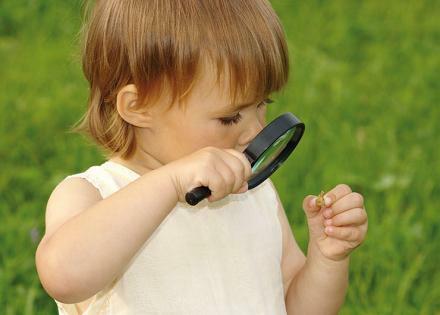 This topic enables children to explore details of both the natural and man-made world, using a range of methods and resources to observe things carefully. All learning will be child intitiated by taking account your children’s ideas and interests. Children will be encouraged to think creatively applying their previous skills, knowledge and understanding to imagine who might have left a trail of teeny, tiny footsteps. We will learn how to look for tiny details with care and concentration, use equipment such as hand lenses, visualizers, pooters and microscopes to observe things closely, discover small wonders of the natural world, look at intricate patterns seen on both natural and man-made objects and observe lots of living things that are tiny. We will kick off our topic by learning all about teeny tiny creepy crawlies! 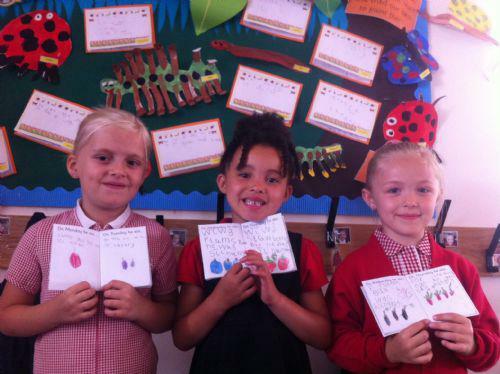 This week we have been looking into patterns, we have looked at different insects which have patterns like ladybirds. Then we tried to create our own repeating pattern we did this first in our books then we created caterpillars which had a repeated pattern. It was lots of fun! This week we have been reading the story of 'The Very Hungry Caterpillar.' We tried really hard to re-write the story in mini books using some key words like 'but,' 'he' and 'was.' We also we also tried really hard to sound out tricky words. We loved being Authors! This week we have been making things ready for the Summer Fayre, we have a Reception stall where we will be selling the bird feeders which we made and our insect cookies come along to have a look at what we have made. This week we recived a letter from a Teeny Tiny Fairy. She granted us three wishes. We had to write these you the 'Can I have...' sentence pattern. Once we were finished we tied or wishes to balloons and let them go! We hope the Teeny Tiny Fairy received them. This week we have been learning all about different types of minibeasts. We had lots of tricky jobs to do. 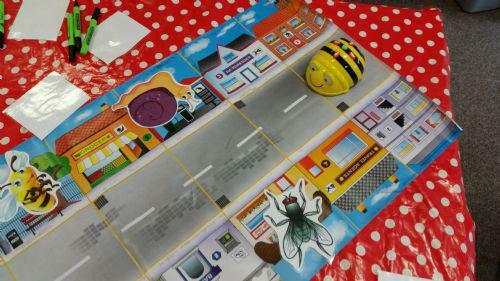 We had to help the BeeBot rescue lots of different beasts and read the word on its back all by ourselves. The words were really tricky like; the, and, yes, dad, mum, can and lots more! We also had to rummage in Gelli Baf to find lots of different sounds to make CVC words such as; cat, dog, bus, tin, pin, cot. It was very tricky but we tried our best! We are spelling superstars! This week we looked at features of teeny tiny minibeast. We made posters and wrote What am I? riddles. We worked very hard and did lots of sounding out. Look at our new display of all our hard work. This week we have been exploring our new role play area - The Garden. There is lots to do inside. We can write letters to different minibeasts and invites to an Ugly Bug Ball. 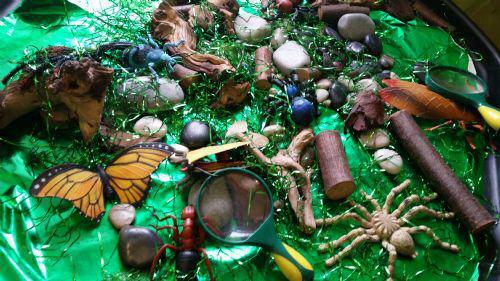 We can explore the Minibeast Safari in the builders tray or read a book under the leaf canopy! We had lots of fun!